Last 11+ Mock Exam 2017 – Book Now! Saturday 9th September 2017. 9.15-12.15pm. Essex University. 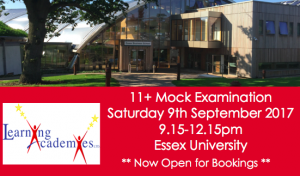 A great opportunity for your child to gain invaluable preparation for September’s 11Plus Examination. Your child will experience previously unpublished papers in both maths and English, following closely the CSSE Format. (Re-takes also welcome). Detailed feedback given. Working under timed, exam conditions in a formal setting will help reduce exam day nerves and provides a unique learning opportunity for students. Email info@learningacademies.co.uk or call 0845 463 1342 for more information and/or to secure your place.